and why you need to visit them now! The stunning islands and towns of Croatia are now some of hottest holiday spots in Europe, but how do you decide which island or stretch of glittering sand is for you? Fortunately, we've rounded up the ultimate guide to the best Croatia beaches and islands, so whether you're travelling solo and fancy an island hopping adventure or you're heading for the sun with friends in tow, we know the best isles for partying, sun bathing, dolphin spotting and more. Sunny Hvar packs in glamour and laid-back charm in equal measure. The town attracts over 20,000 tourists a day in peak season, including celebrities cruising in on luxury yachts, of course. Wander along the stone streets and marvel over beautiful Gothic palaces, lunch at a local wineries, go kayaking at the nearby Pakleni islets or mountain bike across lavender fields. Hvar Town has plenty of popular (and delicious) restaurants that serve both Croatian specialities and international cuisine. Walk down the cobblestone streets and grab a table at Leporini, where you can treat yourself to some Croatian “gregada” or fish stew with potatoes. If you want to dine where the locals do, drop in at Mizarola in the main square for a wonderful choice of pizzas and traditional Dalmatian dishes. The Konoba Menego, located close to the castle, is also worth a visit for its famous goat cheese, drunk figs and homemade wine - why not continue the party and hit one of the towns buzzing bars too? A popular windsurfing destination, Brac is the third largest island in Croatia, dotted with pretty pebbled beaches. 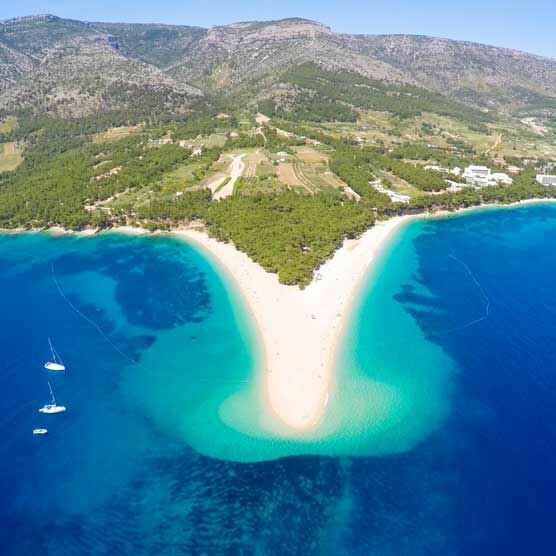 The Zlatni Rat beach in Bol, on its southern coast, attracts watersports enthusiasts, scuba divers, kayakers, paddleboarders, windsurfers and more. Check out Big Blue Sport or Zoostation, to the west of town, where the winds are more gentle. The Vidova Gora Mountain, the tallest in the region at 778 metres, makes Brac the highest in the Adriatic. Discover private coves and enjoy the sight of rolling hills, inhabited by pine and fig trees. Sample the unique local treats, such as fresh white fish, along with wine, an ancient tradition. Go diving in Krk and explore caves! Famous for its varied landscape and stunning natural scenery, Krk is Croatia’s largest island and accessible to the mainland by a mile-long bridge. While the northern coast is rocky and steep, the southern tip offers gentle bays and fertile fields. The terrain is a kaleidoscope of thick forests, sunburnt ridges and rocky hills and the waters are great for a spot of scuba diving, water-skiing and paragliding. Some must-dos include visiting the 13th century Frankopan castle, Biserujka cave and 3rd century cliff-top town of Omisali. Try the Zlahtina wine in Vrbnik, surrounded by vineyards. If you’re seeking an upbeat touristy vibe, there are enough cafes and bar to choose from. Rab's classic golden beaches are a haven for sun-seeking couples, families and friends alike. The most popular Rajska Plaza (better known as Paradise Beach) in Lopar, is a Blue Flag sandy stretch of nearly 2 km, with shallow waters that are safe for kids to paddle in. You can go scuba diving and later hit the restaurants at the beach or in San Marino, perched right above the sands. The family friendly Livacina Lopar Beach is also right next door, with loads of eateries to choose from. For a trip to the wild side, visit Kandorala beach, where nudism made a royal entry with King Edward VIII and Mrs Simpson, who decided to go skinny-dipping here in the summer of 1936. The town itself is a pretty mix of medieval buildings, crumbling archways and Romanesque church bell-towers. Summers are warm, winters are mild and the presence of over 300 freshwater springs make it among the greenest islands in the Adriatic Sea. Rab is also the site of a unique annual Medieval festival, for three days every July, when townsfolk don 15th century costumes and pop-up shops take over the streets, along with strolling minstrels and a knightly contest. Get back to basics at the Kornati archipelago, a cluster of 89 islands, islets and reefs, with a variety of incredible coves, beaches and bays to explore. You can catch plenty of all day boat trips that run from nearby Hvar, and the clutch of waterfront restaurants here make a for a blissful island lunch. Expect fresh fish, beautiful views and open-air barbecues - delightful! Vis sits pretty right at the centre of Kut, a beautiful village filled with Venetian-themed houses - and it's a foodies heaven! You can grab a seat in casual taverns serving unique local delicacies including stews, fresh lobster and pogača od srdele (anchovy pasty) or why not go on a fishing trip and learn to clean and cook your catch yourself? Don’t forget to try its organic wines and the potent Rogacica, made from carob. All this comes packaged in unspoilt beauty, scalloped by small bays and the sight of crumbling forts amid pine trees. Enjoy a game of beach volleyball and treat the kids to ice-cream on the popular Stoncica bay, located about 6km from town. Also worth visiting is the stunning white pebbled beach of Srebrena, known also as Silver Beach, on the southern coast.